Make an awesome first impression from any angle with painted edge business cards. Painted edge business card printing gives your cards a bold yet refreshing look, even when viewed from the side. These cards feature an eyecatching band of solid color around the edges that gives your cards and your brand a truly cutting edge appeal. Painted edge cards are also made much thicker than your regular business cards, which adds a premium heft and makes your painted edges more obvious when viewed from the side. 14 different edge colors are available for these premium custom business cards. This includes a wide variety of solid and sparkling metallic colors, including red, metallic gold, and more. All painted edge business cards are printed on double-thick uncoated cardstock, which offers a luxurious muted look and a nice weight and feel to your cards. Thick business cards with colored edges are popular with creative professionals such as photographers, graphic designers, and anyone else who wants a truly outstanding business card. Colored edge business card printing is also popular with luxury and boutique brands. Use our business cards templates to ensure your artwork is sized and formatted correctly. PrintPlace layout templates for painted edge business cards can be downloaded for each standard size card below, in an EPS, PDF, or JPG format for Illustrator or Photoshop. Better weight and tactile feel. Painted edge business cards not only look great, but the texture of the double-thick 32 pt. uncoated stock feels great too. The additional weight also further emphasizes the added value of these premium cards. The highly visible painted edges can really make a bold statement. The wide selection of edge colors lets you pick a color that matches your brand or business stationery. 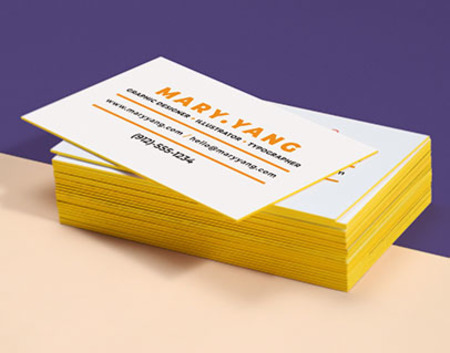 The increased thickness and colored edges of these business cards make them highly visible. When part of a stack, these cards can really stand out and attract your customer’s attention. This makes painted edge business cards the perfect cards to keep at conference booths, reception desks, and anywhere else you want to be noticed. Let customers experience your brand in a whole new way. Print painted edge business cards today.